On Bayesian Filter tab of Spam Reader options window you can view some statistics and edit the custom dictionaries. 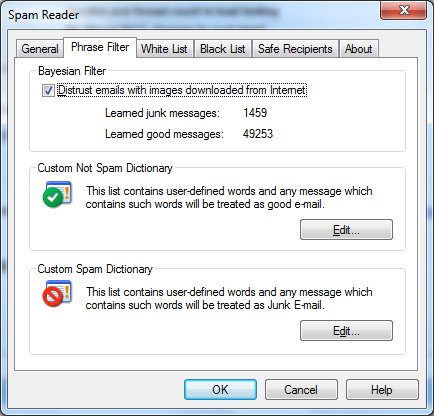 Bayesian Filter statistics shows how many legitimate and junk messages have been analyzed for the database used by Bayesian Filtering Algorithm. 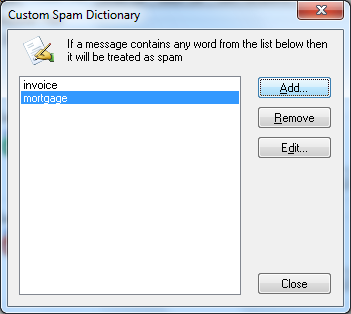 If you want to edit Spam or Non-Spam Dictionary you should click the "Edit" button in the corresponding frame. The following dialog window will appear. Add a new word / phrase. Click "Add..." button to add a new word to the dictionary. Remove a word / phrase. Select one or more word you would like to remove and click "Remove" button. Edit a word / phrase. Select a word you would like to edit and click "Edit" button. The dialog window will appear where you can change the selected word.